Welcome back to our monthly take on economic trends and their interconnection with society. On this show, we will discuss some signs of an impending recession and explore how Rinaldo is balancing his portfolio to protect against it. Rinaldo and Matt explain the inverted yield curve, treasury bills, and their importance in identifying short term and long term inflation. 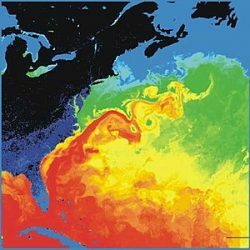 We will discuss the first truly global impact of climate change, the slowing of the Gulf Stream. It isn’t quite like that dramatized film The Day After Tomorrow (2004), but it is a troubling indication of the mounting impacts of climate change that can and will have global implications. The United States birth rates have sunk once again, dipping further below its replacement rate — what does that mean for a nation looking to curb immigration? Our nation is reliant on immigration for population growth, but with the restrictive new policies and immigrant-negative attitudes of the latest administrations, we may lose the cushion necessary to grow our nation. Did you miss our April podcast on shifting markets?